It’s Tuesday and you know what that means, ladies — the start of the American Idol week! I love American Idol! 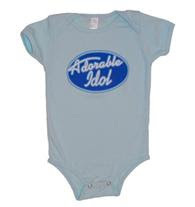 If you’re as in love with American Idol as I am, check out this adorable onesie from Babesta. Taking inspiration from the hottest show on TV, Babesta.com created the onesie, Adorable Idol, in both pink and blue so moms and dads can have their own little idol. It also comes in tees.